I met a young woman last Saturday afternoon, fresh adventure glowing on her face. 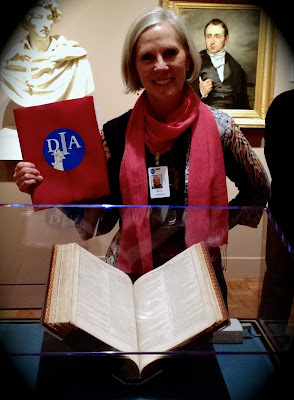 A new volunteer for the Detroit Institute of Arts, she recently returned home to her family and the employment of her dreams. “Although I love Grand Rapids, it’s good to be back,” she said. “Your timing is perfect to see Shakespeare’s First Folio." We chatted about her life in Grand Rapids before we parted for our separate galleries. It was our first of three shifts, and my last was the third floor where the Master’s First Folio waited. Surrounded by art and folk strolling the Great Hall, the place seemed a stage where lovers cling to one another’s arms, parents chase toddlers, children spin until they fall down dizzy, and the gray-headed carry and kiss newborn grandchildren. Shakespeare’s seven ages of man unfolded in constant cycles. Life as I like it. My duty was to assist her defense of the book Shakespeare gave us, prevent the display’s sensor from tripping the alarm. Giddy, I marveled that I, a girl from Appalachia, stood beside Shakespeare’s folio, and praised my Scot/Irish ancestors for their gift of story, the verse they imparted on midsummer, honeysuckle nights. I praised Ms. Shingler, my tenth grade English teacher, who casted our class to read Romeo and Juliet aloud. The needless tragedy reinforced my teenaged conviction. Life is a miracle to protect, not destroy. 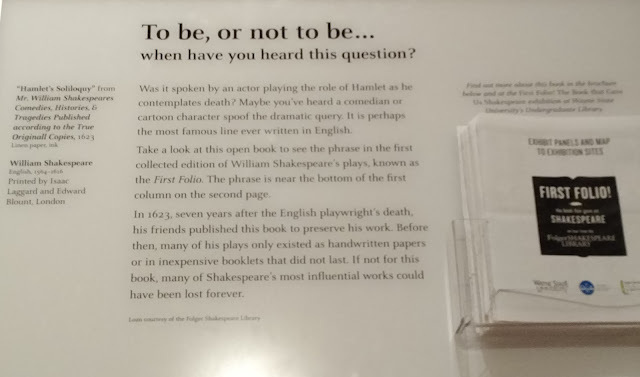 A tall man, my contemporary by appearance, bent over Shakespeare’s tome and read “To be or not to be”, one of the most quoted lines of all time. “Two of Shakespeare’s friends who were actors gathered his plays and published them after his death. We may not have Hamlet today otherwise,” he said. Because the bard wrote his plays to be performed and not published, a total of eighteen works would’ve been lost, including As You Like It and Macbeth. The Folger Shakespeare Library, Washington DC, is home to the world’s largest Shakespeare collection, including 82 of the known 233 First Folio copies in the world. To commemorate Shakespeare’s 400th birthday this year, the Folger Library is touring Shakespeare’s First Folio across America. Each destination will choose what play and passage they will display to tell the human story as only Shakespeare could and does. From east to west, north to south, we will draw close to one another and share the common themes of our human condition, our affection and distain for his characters. Dear Reader, I think it beautiful to learn about the two actors who saved William’s works, to read Hamlet’s question again. Note: Shakespeare’s First Folio is on exhibit at the DIA only through April 3.